APIA, Samoa -- Over 150 delegates and members of the international development community from more than 45 countries were stunned to see leader after leader approach the podium to sign a historic sustainable energy and climate resilience treaty that will significantly change the lives and destiny of over 20 million small islanders, for the better. 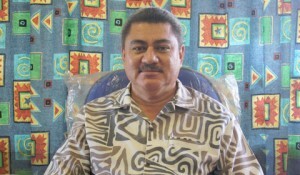 Led by the deputy prime minister of Samoa, Fonotoe Nuafesili Pierre Lauofo, multiple leaders from the Pacific, Caribbean and Africa, Indian Ocean and Mediterranean Sea (AIMS) regions, forcefully raised their voices in unison and accepted responsibility for fulfilling the commitment to the Small Island Developing States (SIDS) Sustainable Energy mechanism – SIDS DOCK. The opening for signature of this historic SIDS DOCK Treaty – a SIDS-SIDS initiative -- was a major highlight of the first day of the United Nations third international conference on SIDS, taking place in Apia, Samoa, from September 1 to 4. The unprecedented and unexpected number of heads of state and government present sent a strong signal to the standing room only audience, the SIDS population and the international community, demonstrating how deeply committed SIDS leaders are and that they all firmly believe that SIDS must, have and will take responsibility for charting the future of their countries towards a path that would see a total transformation of the SIDS economy away from fossil fuels, to that of one driven by low carbon technologies. The event was considered so important to the Republic of Cabo Verde, that the prime minister, José Maria Neves, excused himself and his entire delegation from the Plenary Hall, to ensure that Cabo Verde, a SIDS DOCK founding member was well-represented at the signing – the Cabo Verde government has one of the most ambitious plans in SIDS, that aims to achieve 100 penetration of renewable energies in Cabo Verde, by 2020. More than half the members of the Alliance of Small Island States (AOSIS) were present for the signing of the historic treaty, witnessed by the SIDS DOCK partners Denmark, Japan and Austria, whose kind and generous support facilitated SIDS DOCK start-up activities. Also present were SIDS DOCK partners - the United Nations Development Programme (UNDP), the World Bank, the United Nations Industrial Development Organization (UNIDO) and the Clinton Foundation. The treaty was signed by the governments of Barbados, Belize, Bahamas, Dominica, Cabo Verde, Cook Islands, Dominican Republic, Fiji, Grenada, Guinea Bissau, Kiribati, Niue, Palau, St Kitts and Nevis, St Vincent and the Grenadines, Samoa, Seychelles, and Tuvalu. The statute will remain open for signature in Apia, Samoa, until September 5, and will re-open for signature in Belmopan, Belize, from September 6, 2014 until it enters into force. Belize is the host country for SIDS DOCK, with Samoa designated as the location for the Pacific regional office.